Deprived of his inheritance by the evil Roger de Courtenay, Robin flees into Sherwood Forest, where he becomes known as Robin Hood by the band of merrie men he forms with fellow outlaws. 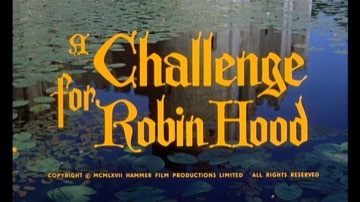 A life of robbing the rich to give to the poor follows, but Robin still has a score to settle – he is accused of murder by de Courtenay and his friend the Sheriff of Nottingham, and Robin has to fight to clear his good name. The director, who was also known as C.M. Pennington-Richards, had previously made comedies such as “Double Bunk” (1960) and “Ladies Who Do” (1963). Barrie Ingham faced the constant threat of extermination by murderous pepperpots as a Thal called Alydon in the Aaru (Amicus in all but name) production “Dr Who and the Daleks” (1965, starring Peter Cushing). Peter Blythe also played a villain, Anton, in Hammer’s “Frankenstein Created Woman” (1966). Leon Greene had a much more substantial role as Christopher Lee’s protégé in Hammer’s “The Devil Rides Out” (1967). The voice of actor James Hayter became known countrywide from the TV adverts for the products of a certain company which “makes exceedingly good cakes”!